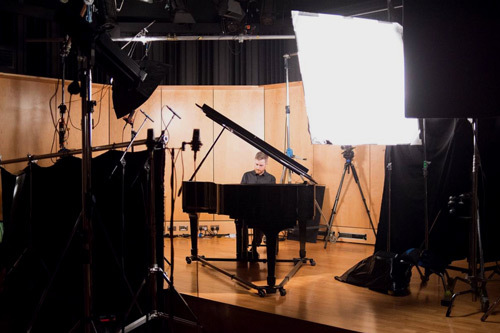 One of the world’s leading music publishers, Edition Peters, has recorded material for its new interactive iPad app in City’s Performance Space. The app, Tido Music, helps students, teachers, performers and enthusiasts discover, learn and play music. It includes masterclasses from City alumna Clare Hammond, current instrumental tutor Richard Uttley and world-leading concert pianist Joanna MacGregor. The tutorials are being used in the first collection of content on the app, called Piano Masterworks. It contains responsive digital sheet music, texts, interactive tools, audio and video recordings of performances and tutorials. Dr Miguel Mera, Head of the Department of Music, said: "I am delighted that we were able to work with Edition Peters on their new app, which promises to be a ground-breaking music teaching tool. “I am also especially pleased that City alumna Clare Hammond, and one of our current instrumental teachers, Richard Uttley, were among the illustrious performers featured in the app." Marc Dooley, Head of Digital Content Development for Edition Peters, said: “In making Piano Masterworks for Tido Music, Edition Peters seeks to produce audio-visual materials of the highest quality, with musicians of international calibre performing and discussing great piano repertoire.